Have you ever been asked “Do you have children?” I know that I have been asked that many times. Sometimes the answer can be straightforward and sometimes it can be a little awkward. A few years ago, I remember being invited to the home of new friends. When we arrived for dinner that evening, I asked them that question. But my question was met with a moment of hesitation and then an explanation. I learned that they did not have any biological children but they did have children and she began to tell us about them. She was a professor at the Center of Philanthropy at IUPUI in Indianapolis and he was a former president of two colleges. Through the years they had befriended quite a number of young college students who were struggling with life’s challenges for one reason or another. They had provided a temporary home for some at very critical times in their lives. She began to tell me about many of their “children” as she called them, mostly girls, I believe, who needed the influence of a mother and a father. Victor and I have known this couple now for many years and they are truly a fine couple. I admire them for their willingness to help others. She has also been a great deal of help to us in our humanitarian work. And what a valuable help she is, as she is a professor and highly sought after instructor in the field of philanthropy. I asked her if they continue to have contact with the “children?” She said, “YES, with many of them.” Some of these the young people are having children of their own and our friends have become grandparents to the little ones. I feel Lilya (that is her name) is a woman of valor. She saw where she could make a difference and she gave of herself for that purpose. Now I must admit that I felt a need to look up the word “VALOR” when I first heard what the theme of this weekend was going to be. And from that definition of courage I have chosen a story to illustrate it. In mid January, Victor and I returned from a trip to the Sabbatarians in Ukraine. Before I go on, I like to give my husband a bad time about where he takes his wife in the dead of winter. While my sister’s husband is taking her to their winter home in Florida, Victor took me to Ukraine and from Ukraine we traveled north until we nearly reached the Arctic Circle. But putting the winter weather aside, we did have a very good trip visiting our scattered members in Eastern Europe and in the Nordic countries. It is from the trip to Ukraine and from previous trips to the Sabbath-keepers in this area that I felt inspired to want to share one of their stories with you. First I would like to introduce to you Irina Polichko. 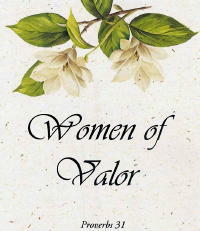 I believe that she is an excellent example of your theme “Women of Valor” or a woman of courage. I would like to share her story with you. Irina and Vasil were Christians in the Soviet Union when you were not allowed to openly believe in God. At one time in the Soviet Union it was illegal to own a Bible. But, following the break-up of the Soviet Union, things were more open and they wanted to share their faith with others. They found a way to team up with some Christians from Latvia who had printed Christian literature for distribution. They were able to get some of the literature to Ukraine. They set up outside, in the summer, and began to evangelize in their village. Their evangelism included a lot of music and this attracted young people who enjoyed singing with them. As winter arrived, it was necessary to take their music inside. They had a small building where they could meet for Sabbath services. Many of the young people wanted to continue to sing with them so they invited them to come to their building on Sunday afternoons for music. Many young people (about 50) began to do that but word of this began to spread. The Polichko’s were Sabbatarians and not a part of the main stream Ukrainian Orthodox Church. Some of the parents in town warned the children that if they went to meet with the Polichko’s that they might be sacrificed. This is a true story. We spoke with one of the young ladies who was among these first children and now works full time for the Polichko’s. She said she remembers going those first times with the other children and looking for places along the way to hide or take refuge just in case they would need to escape. Needless to say they were never in any danger. As I mentioned, they began with the group of about 50 young people but then an Orthodox priest in the village got word of what was going on and a decree went out to his parishioners. He told the parents that if the children were to continue to associate with the Polichko’s, they (the parents) would not be allowed to take communion nor would the priest bury their dead. After that the numbers of young people coming to sing dropped way back but settled in at about 20. Irina continued to sing with the young people, always singing spiritual songs and teaching them about God. Irina could have probably called the police or taken some other drastic measures but she decided instead to talk to the street children. She told them that they could either be enemies or they could be friends. Then guess what she did? Some of the children did take them up on it. Food is a mighty big draw. As I was getting information for this story, I was very surprised to learn which of the children, that I have come to know, were apart of these unruly street kids. They are still there today. This was my third visit to the children but it was the first time that I had heard that part of the story. It was about this time in the life of the Polichiko’s that Victor was introduced to them in June 2001. One of our very good Ukrainian friends asked if we could help them to continue with the mission of teaching and caring for these children. Irina wanted to expand to a soup kitchen and feed the children every day. The city was willing to donate an old building but they needed our help with the cost of the food. That began our involvement with Irina and her husband. Thus begun the Polochiko family of about 30 children, many from neglectful and/or abusive homes, homes with alcoholic parents or drug abuse. Some are from a very large family where the mother has died, the youngest children were sent to an orphanage and the others were left to mostly care for themselves. Irina has a beautiful soft but firm voice and the children respond well to her. She keeps clean clothes on hand for those who need it. The children are always clean and well groomed when we are there. During the school year the children come to the center after school. In the summer they spend most of the day there singing songs and learning about God. In the afternoon Irina and Vasil take them on outings to the country, on picnics, or to the river or other such activities. Vasil is now nearly blind. Irina does all of the driving to pick up the children or to take them on the afternoon outings. They were using an old bread truck that someone had donated to them for transportation. It had no side windows and little seating space. Last year we were able to help them purchase a very nice van to transport the children. Today the street children are happy, loving, beautiful children. Some are now approaching adulthood. Slava has graduated from high school. His sister Edita is approaching graduation. They are being given every opportunity to make right choices in their lives. Through Irina they have witnessed an excellent example of how God can change their lives for the good. But now as adults they will be faced with making right choices for themselves. They still have the same challenges facing them as they did eight years ago. Chances are that their home life has changed very little. Some still have the pressures of abusive parents, alcohol may be readily available in their homes, parental supervision is mostly non-existent and I know that for one of the families there is even mafia and gang influence. So you can see that the challenges remain great. I do know that because of Irina and her love for God and for these children it is possible that that cycle of pain in their lives can stop. And what a beautiful thing that is! Could it be an example of the kind of work we will all have cut out for us as we begin life in the Millennium? Slava, who I mentioned, has finished high school, has chosen to continue his studies and to learn a profession. His sister, Edita, is very special to me. She is less focused then her brother but I am praying that she will choose to continue her studies. I am hoping to see a commitment from her and from the others to continue practicing God’s way of life. And as with all of us they will have to make that choice. Now, for the rest of the story, as Paul Harvey would say. I learned on this last visit that the story of the street children is only one part of what Irina and her husband have undertaken. Even before the work with the street children began, they had embarked on another dream, an impossible dream that is now slowly becoming a reality. When the Polichko’s began this undertaking they had been promised help from a group in Switzerland. A delegation had been there to visit them and everything. They sent one container and then told Irina and Vasil that the project was too big and they could not continue to help. Vasil sold and bartered items from the container and scraped together enough to get started. God has obviously blessed there efforts and patience because twelve years later their impossible dream is coming true. It is very nice, very comfortable. We stayed their on our visit in December 2007. It is a four story building in the country. Each floor will provide living space for a family unit. That is surrogate parents and six to eight boys. The first family is now living together. The surrogate parents are a young couple (not real young). They were married last year and very shortly after, with God’s blessing, the children begin to arrive. Not just any children, these are boys ages 8-12 years of age, many of them with traumatic backgrounds. Two of the boys saw their mother dead after their father had killed her. These are humongous problems and it takes an enormous dedication to want to help. Irina’s dream is coming true. They are providing a family atmosphere with healthy sit-down meals, scheduled chores, comfortable beds, prayers, Bible studies and lots of love. Now that the building is nearly completed the government does help to provide funding for the boys. The boys are very likely behind in school and each afternoon, after school, a tutor comes in to help them to catch up with their studies. A summer camp is being planned for the street children and the boys. It will be on the property where the four story orphanage home is located. This is in a wooded setting in the country. Four adults are going to travel to Ukraine to take part in that camp. 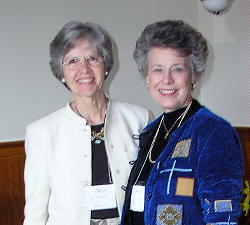 One is a retired school teacher from our Lafayette congregation. Also a young American couple, Dan and Cindy Harper, who reside in France will be going. The fourth individual is a young man from Sweden. They will teach English as a Second Language classes and whatever else they can do to help out. So the next time you are asked “do you have children?” think of the mothers I told you about today and consider how you can make a difference in some child’s life. Most likely that child will be your own or your grand children (that’s my role now) and that too is every bit as important.